We were worried Asha was getting lonely, because I haven't been home as much and she was acting out a bit (we think because she misses us when we're gone). So we ended up finding Nikko at a pet fair on Saturday by chance (we were really in the area to get In & Out grilled cheeses and burgers, but swung by Pet Club on a lark). He's 6 mos, already as big if not bigger than Asha, and is Mr. Curious and happy. Asha hates him. Or she hates the smell of another cat. She's been growling and hissing at the bathroom door (where nikko is located). We've had them exchange rooms, and we have asha eat her food in front of his door on a blanket he's slept and played on like we've read on the internet. If anyone else who has introduced kitties has any advice on this, it'd be much appreciated! I got a package from my secret pal on Saturday! She had her Stampin' Up friend send me a whole stamping scrapbook starter kit! There are some cute stamps and a pretty plum colored stamp pad! There are also some blank cards and envelopes so I can send out some fun stamped cards to people in my next RAOKs! 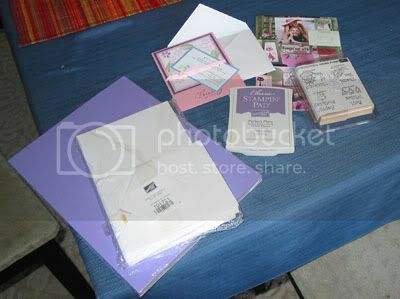 There's also a bunch of cardstock that I can use to start scrapbooking. Thanks a bunch secret pal! I love getting new stamps and crafting supplies! Vintage pattern of the day and a contest!!!!! Yup A CONTEST!!! You see, here at Lorispeak, we had a bit of a celebration on friday complete with really yummy sweet champagne (actually Chamagne as it was from Champagne, we usually drink sparkling wine from CA)! On Friday I had 101 subscribers according to Bloglines! Today I'm up to 104! It's a big milestone for my blog, and we're going to celebrate it with a contest. I haven't quite figured out the prize yet, but it will be special and knitting related (perhaps some yummy handspun? :) ). Add your spot to my guest map, and then comment on this post. I will do a random drawing based on the comments next Monday, March 14th. I have set my flag down - I am posting a comment and now I will wait for the sweeeeeeeeeeeeeeeeeet draw to happen. NIKKO!! what a cutie.. i posted my flag !! woohooo... let the games begin! I added myself to your map. Good idea. Richmond VA present and accounted for on your map - can't wait to be the winner! Your new kitty is such a cutie! I'll be reading with interest about your cats - we're thinking of getting another one, too. I signed your guestmap! I just have to say...what a cute kitty!! I signed your map too. Good luck with the new kitty. He's beautiful! Nikko is adorable... I've always read that time is of the essence when introducing new kitties to each other. Dislike turns to curiosity eventually ;). The guestmap is a cute idea! Also, regarding your sidebar, Adagio is da bomb. I have the honor of being your first out of country response! Hello from beautiful Britsh Columbia! What a great idea, I may have to give it a try on my blog. I love the vintage pattern pictures you post & yay for new kitties! I added myself to your map thing. It's really hard to pick the exact location (especially since I live on an island & it doesn't show up on the map) but I think I got it close. what a cute kitty! and I posted my flag, such a fun idea. Someone got my spot so I tried to get as close as I could! Hi Lori! I posted on your map too! Can't wait to hear how Nikko likes yarn! We introduced our kitties in much the same way. Let them get used to the smells until it's no big thing. When they met face to face for the first time, I stood holding one and the husband held the other. We did that a couple times a day for a bit until we finally just let 'em loose. There was a little hissing, but that was it. Best of luck! You almost make me want to have a kitty of my own...I'll enjoy yours from a distance! Whenever we bring a new cat in the house, the first thing we'll do is to show him/her were his toilet is. Then just let them be. No special room or anything else. Cat's will soon start accepting eachother. The longer they stay in a seperate room the longer it takes for them to get along. Awwww! So cute! Can I come play with your cats? Nice stamps, too and I like the idea of the contest. I added myself to the map - quite of few of us from the Silicon Valley! lovely kitties! I think just give them some time and they would learn to get along. When I introduced my second cat, it took at least a week before they would share the same furniture space, so I would say that you're already making lots of progress! By the way, I posted my flag. You've got quite a few Bay area flags, so I'm sorta floating out in the Pacific. But, since I'm from Pacifica it works. ha,ha! Ohio is now officially flagged! I guess the rest of the state is digging out of the snow. I set my flag from snowy Connecticut! Have an awesome weekend! OH what a cool idea. I'm going to add my flag now. I marked my spot in Cincinnati, OH! Love your map--it sure has grown since I placed my mark earlier in the week. Cool contest! Have a great weekend. p.s. kitties are tres cute! isn't it fun to have so many cyber friends coming over to see whats up? 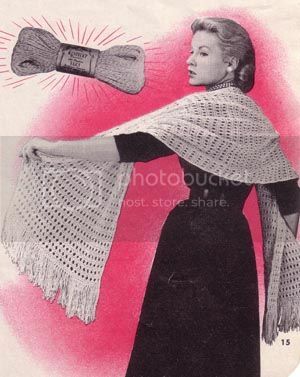 i particularly like the vintage knitting patterns you feature...what a unique idea! Posted my flag! What cute kitties! Isn't it wonderful to share life with the little boogers. I've got three of my own. Here's a shout-out from chilly Rockville, MD! LOVE the vintage knit of the day, and what cute kitties!! Nifty contest! It's fun to see all the map pins. And glad you got the cookies--hope they weren't crushed! And finally--I agree with everyone else--Nikko looks like a real sweetie.